Three trillion tonnes of ice is an near impossible thing to wrap your head around. Even the standard comparisons—it’s 1.2 billion Olympic swimming pools—don’t really make it compute any better. But it’s that very profound nature that makes what’s happening in Antarctica so alarming. New findings published in Nature today show that the seventh continent has lost nearly three trillion tons of ice since 1992. And that ice is melting out at a quickening pace, showing that we’re quickly driving the climate over the guard rails that have allowed humanity to flourish. What’s in the ditch on the other side is not pretty. Dozens of the world’s leading Antarctic researchers contributed to the paper, which updates an analysis that had run until 2011. The new analysis, which uses satellite, radar, and other tools in the ice-observing toolbox, extends the data to 2017. The vast majority of the ice loss is occurring in West Antarctica where warm water is intruding under glaciers and causing them to become more unstable with each passing year. A quirk of geology is making matters worse. The bedrock under the landbound ice slopes downward, which is in turn allowing those warm waters to march ever further inland. It also means the ice cliffs at the snout of those glaciers are getting taller and more prone to collapse. It’s an untenable situation and one that could lead to runaway melt that would raise sea levels more than 10 feet. The Antarctic Peninsula is also shedding lots of ice thanks to the incredible collapsing Larsen ice shelves. Larsen A and B bit the dust in 1995 and 2002 respectively. Their remaining neighbour Larsen C unleashed a massive iceberg last year and scientists are still gauging the health of what’s left attached to land. Only the East Antarctic ice sheet, the largest of Antarctica’s three major ice sections, appears to be in stable shape. The findings show it’s quite possibly growing, but even the growth there isn’t enough to offset the icy casualties elsewhere around the continent. “The work is consistent with previous studies indicating massive losses of ice in West Antarctica and on the Antarctic Peninsula, but it brings the estimates up to date and confirms that they are significant,” Bethan Davies, a lecturer at the University of London who wasn’t involved with the study, told Earther. The research also confirms that the land is springing upward due to the ice loss. So yes, we’re not only wiping out ice, we’re changing the shape of the planet. The increases are on the order of a few millimetres per year, but scientists need to account for them to ensure their other measures of ice loss are accurate. The measurements are vital information for the nearly eight billion of us who don’t live on Antarctica, because they allow scientists to compute sea level rise rates and contributions. Getting a handle on what glaciers are melting fastest also has a bearing on what areas are likely to flood first. There’s even a NASA website for that if you want to see where your town stands (for now, anyway). 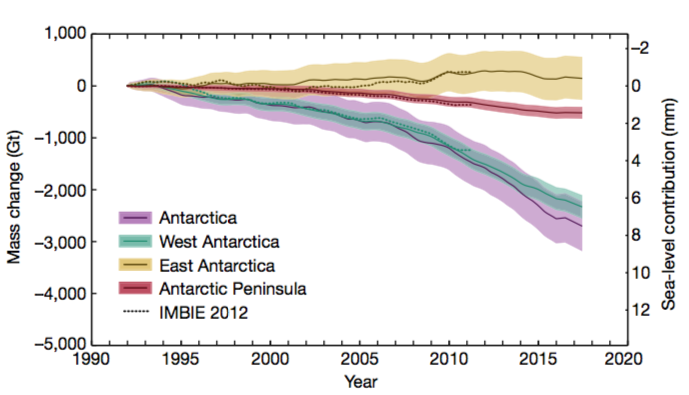 Antarctic is hardly alone in losing a elephantine amount of ice. Previous research has shown Greenland—the planet’s other major store of ice—lost a trillion tonnes of ice between 2011-2014. Rising ocean and air temperatures mean that the numbers that seem fantastic today could become the norm, which means we’ll need to come up with a better measure than Olympic swimming pools to describe our planetary loss.